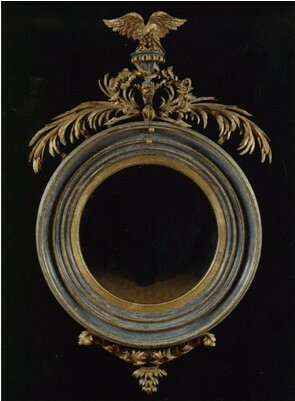 One of a pair of Regency giltwood and grey painted convex mirrors. A mirror plate is a sheet of glass or metal used as a reflective surface in a mirror. The earliest mirrors, made by various ancient cultures, were of metal, hammered into a smooth surface, usually of convex shape and polished until they were highly reflective. Although convex glass mirror plates, made reflective by applying very thin sheets of metal to their backs, first appeared in the 1st century AD, it wasn’t until the Renaissance that Venice became a major center of glass mirror production, and that the first flat glass mirror plates were made. Before long, despite the attempts of the Venetian government to keep their methods of mirror-making secret, the practice had spread throughout Europe, though the cost of mirrors remained extremely high. As stronger glass and new methods of applying metal to glass were developed, mirrors became more affordable, and were able to be made with new kinds of decoration, such as cut glass and reverse-glass paintings. Full-length mirrors and furniture incorporating mirrors also appeared, both in the 19th century.